Is this Ick or something else? What should I do? Aggressive Koran Angel Hi WWM Crew, <Hi, Don with you today> I need some of that knowledgeable advice you guys are so wonderful about giving. I?m just starting out with a newer 55 gallon with 4" of live sand and 75# of live rock. All water parameters are great, Ricordea Mushrooms are thriving and the snails have been happily doing their jobs for about 7 months. The problem is my very aggressive Koran Angel. (He was an impulse buy ? so pretty?and now after doing research I know the tank is to small for long-term ? Hoping he will be OK for a couple of years ? if he makes it?) He was one of four fish added when the water was safe, and is definitely the king of the tank. Mated Ocellaris Clowns, and a strawberry Pseudochromis were his tank mates. The female Clown jumped out after 3 months , and I had to put the Pseudochromis in the quarantine tank for safety as she and the Angel were so hostile towards each other. I rearranged the rocks and added a tiny little Ocellaris Clown (after a month in another 20 g quarantine tank), which the other clown seemed to accept, but was harassed by the Angel. I thought they would adjust, but in the morning the little clown was no where to be found. Besides the Angel, there isn?t anything in the tank that could have harmed the little one. Now the Angel is taking shots at the male Clown ? besides the cleaner shrimp and snails, if anything moves in or even goes close to the tank it gets attacked. Seriously, the Angel attacks the glass if anybody sits in front of the tank ? this behavior occurs even after he is feed. When you move back he stops, when you move back up he?s biting the glass in front of you. I really do not want to return the Angel, but I can not allow him to misbehave so terribly and he seems to be getting worse. I don?t know, maybe he is board and needs some dither fish? Following is the plan to expand my reef and hopefully settle down the Angel, please let me know your thoughts. <It needs more room and fewer other fish in this small of tank> Quarantine Angel for about 6-8 weeks in 20 gallon tank (this should allow enough time for the new members to established territories) Rearrange rocks Add Royal Gramma, False Percula Clown, Flasher Wrasse, Midas Blenny, Purple Tang, Purple Blade Gorgo, Toadstool Leather, Cabbage Leather, Lobophytum Leather, Blue and Red Mushrooms Reintroduce Angel I?m hoping since he hasn?t bothered the Ricordeas, the other corals will be fine ? I am really worried about the little fish, although I think the Tang would be OK. I am attached to the little psycho, but if I want other fishes, maybe I just have to cut my losses? After 2 years, if I did wait and set up the 125 ? what other fishes could get along with him? <I understand you position and anguish but I would not reintroduce the angel. I would not introduce the purple tang (or any other tang) for the same reasons as the angel (aggressive and too big for a 55) The rest of the list, with the Pseudochromis, looks good. Personally, I would stop there as there are many benefits to a small load on a system. Hope this helps, Don> Sorry for the length, but I?m really torn - any input would be greatly appreciated. Koran Angel thanks, Now that you mention mechanical injury, I think he might have bumped really hard into a rock when I turned on the lights when I thought I heard a mantis shrimp in my tank. Thanks for the reassurance. David. >> Ah, I suspected as much... take it easy always on the sudden lighting issue... turn the "house lights" on and wait a good ten minutes before turning on any/some of the tank ones... a big deal, yes. Bob Fenner, glad to render reassurance. 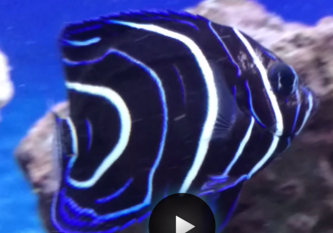 Koran angelfish I'm really interested in purchasing a Koran angelfish, Pomacanthus semicirculatus. I've been doing my reading on the angelfish and realize that they get really large and require a large tank with good water conditions. They are grazers in the wild and eat corals and sponges too. I'm willing to provide it with seaweed for it to graze on, and have some live Caulerpa for it to feed on. I will also provide sponge in it's diet. When doing my reading I learned that they are probably one of the least difficult of all full sized angels. I would like a Imperator (Pomacanthus imperator), but I've read that they are very sensitive to water conditions. Now I must admit at times I don't do my regular water changes. I've never had nitrates above 25 ppm. 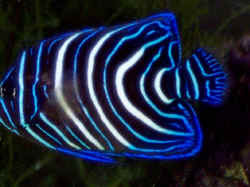 I don't think i would have a problem taking care of a Koran angelfish. Now my questions are: 1. Are there any insights that you have on this fish as to care or special requirements? 2. I've read that it's rare to see this animal's adult coloration in it's adult stage, why? Should I be worried? Is there anything I could do to get it to change or aid it in changing? I actually like it's adult coloring. 3. I've also heard that these fish are susceptible to HITH and HLLE, other then nutrition how to I prevent it? Does grounding work? How do I ground a tank then? Thanks for your help. David. >> The Koran is one of my favorite large marine angelfish species (too)... 1) The Koran has no real special care requirements... you have listed some of the general caveats... varied, veggie-containing diet, good water quality... 2) I think the lack of adults, coloration and otherwise is a matter of economics and mistakes. The dollar part of the equation has to do with people importing juveniles (freight is much less), and the mistake part refers to aquarists bumping them off before they reach adult/color proportions. 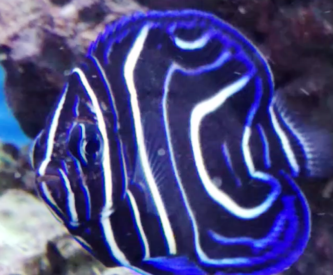 3) The semicirculatus angel is susceptible to HLLE more than most fishes... the best approach is twin-pronged: optimized nutrition (even supplementing the foods with vitamin and iodine prep.s), and consistent/high water quality... I discount the "stray electrical potential" hypothesis. Bob Fenner, who has a piece that never ran in the hobby mag.s on the species posted at www.wetwebmedia.com and will put up the images there if there is a call for same.